Licensed hair stylists and nail technicians are also available. Ask about our Glam Squad packages, groups and events. 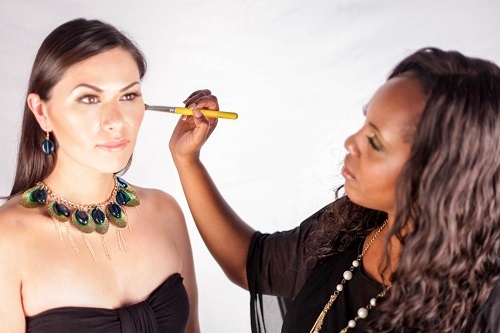 Courtney Dade is the owner of All Frills Beauty and a certified make-up artist in Southern California. She has always had a passion for frilly and beautiful things, which she manifested in her own signature make-up looks. While working as a Marketing Director in Corporate America, she had the reputation of always putting a little “diva” into everything she produced. Rather than making a round peg fit into a square hole, Courtney has followed her passion, and has become a makeup artist and beauty consultant! She obtained certification from CAMMUA Makeup Academy, where she confirmed that her passion was really her purpose. For the past few years, she has done various photo shoots, runway shows, red carpet looks, and editorial work in Southern California. Most recently she has begun as a contributing beauty blogger for The GOODS Online Magazine. She also provides professional and personal makeup classes supporting both aspiring makeup artist and people just wanting to be able to create a custom look for themselves. Need to refresh your makeup collection? She has you covered with that as well, as a seasoned Mary Kay Beauty Consultant and Motives Pro Artist Consultant, she’ll have you looking beautiful everyday! Check our services page for pricing or get started right away!